If you think kids do nothing but play computer games and watch TV, think again. Some, as young as eight, have started their own businesses and are already on the road to commercial success. Four young people explain how they became entrepreneurs at an early age. 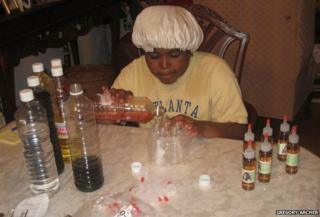 Leanna Archer from New York started selling home-made hair products when she was eight. Today her company, Leanna's Inc, has gross annual sales of about $500,000 (£300,000). Her first product was based on a recipe from her Haitian great-grandmother. "So many people I knew wanted to use the same products that I was using in my hair and it sparked an idea in my mind to market the product," she says. Archer gave some free samples to people she knew. "After they used it and they liked it, they came to me and said, 'You know what, I have $20 (£12) - how much of that product will that get me?' And that's where the idea to start the business actually came from." She started mixing the ingredients in the basement of her home on her own - now there are eight people involved and they are hoping to expand out of the basement this year. One of her biggest challenges was to be taken seriously. "But as I got older, people started to realise that this was not just a phase - it was something that I was working and developing and I was the driving force behind it." Archer is now 18 and is studying political science at university. She wants other youngsters to know that "everything seems impossible until it's done, so if you find something that you're passionate about - pursue it". Anshul Samar was 12 years old when he came up with an idea to make learning chemistry fun. Over the next two years the Californian schoolboy worked on his card game, Elementeo, which brings the elements of the periodic table to life. It went on sale when he was 14 - he made 5,000 games to start with which sold out. Since then he has produced an updated second version and has developed an Elementeo app. "Even from the beginning I always wanted to take this to become something big," he says. Samar had a rare lung disease when he was 13, but he didn't let this stand in his way: "While I was in bed and I missed a lot of school, that was actually the time in which I developed a lot of Elementeo." As a child he felt he had nothing to lose: "Even if something does mess up, you still have your skateboard in the garage and school to go to the next day - things just kind of keep going." Samar had a lot of support from his community. "There was a group that gave me a small $500 (£300) grant... that was really the inspiration that got me started - someone from outside said, 'Hey even if you're just a kid we believe in your passion and we believe in your idea.'" Samar is now at Stanford University. "School is my first priority and always has been - with things like Elementeo they're just a lot of fun and the fun and learning tend to balance themselves out." When South African Ludwick Marishane (left) was 17, he came up with the idea of DryBath - a gel to replace soap and water. He has spent the past six years developing the product and has raised funds through business competitions. The gel is now on sale and Marishane has won awards along the way. Ilwad Elam and the other entrepreneurs featured spoke to Newshour on the BBC World Service. "You have to think about people who use the bucket bathing method - this is the way I stayed clean and this how almost half the world stays clean," he says. "The water [in the bucket] gets extremely soapy, therefore it becomes really tough for you to rinse the soap off. You have to kneel - it's a really undignified way of staying clean." He says DryBath changes all that - you put the gel on your body and rub it off with your hands. "If you're really dirty - you've got mud, dust etc on your skin, you can wipe it off with a damp cloth and you're clean." When it came to getting feedback for his ideas, his father helped him to develop a thick skin. "Whenever I tried to do something, he was the one who provided me with the most critical feedback." "I learned from a very young age not to take feedback to heart, especially if it was negative - just to take it for what it is and work and improve on it," he says. Ilwad Elman was born in Somalia but spent her childhood in Canada - her family moved there after her father was assassinated when she was three. When she was 19 she decided to return to Mogadishu. "There were only about four districts that were controlled by the government - the rest was taken over by al-Shabab at that time so the crossfire and the front lines were literally in my backyard," she says. She became a social entrepreneur working with her mother to set up Sister Somalia - an organisation that provides counselling, medical services, education and business starter kits to women who have survived sexual violence. She has helped 1,600 women set up their own businesses including shops, courier firms and food import companies. She has also helped former combatants to start afresh. "It was really difficult for some people to see a young person in a position to lead… I even at times had people walk out of meetings just because they couldn't handle the idea of a young person trying to convey these messages to them," says Elman. "There is life beyond the bullets… people are very entrepreneurial, people are very motivated and there is opportunity for change," she says. The entrepreneurs featured spoke to Newshour on the BBC World Service.